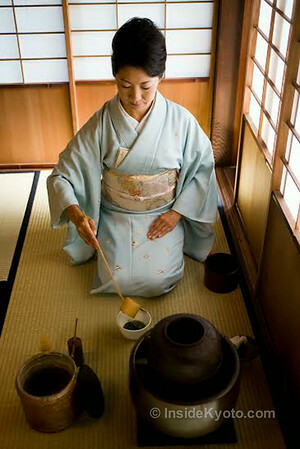 Kyoto was where the tea ceremony was born and remains its spiritual heart. If you want to try this most calming of cup of tea, Kyoto is THE place to try. In a hurry? Scroll down to see our listings of tea ceremony places in Kyoto. Otherwise, read the following introduction to the tea ceremony. Tea has been drunk in Japan for over 1,000 years, but it was only around the 16th century that the practice took on the highly ritualized form by which it is know today. Warlords, wealthy merchants and literati all competed to lay on the most lavish and sophisticated tea ceremonies. While some enthusiasts favored showy and highly refined tea ware and tea rooms, the prevailing sensibility gradually started to favor an understated, plain, even rough aesthetic, by which much of Japanese art is now known. This unadorned and rustic aesthetic is commonly known as “wabi-sabi” and one of its leading proponents was the tea master Sen no Rikyu (1522-1591), who was the favored tea master of many a powerful man of his day. 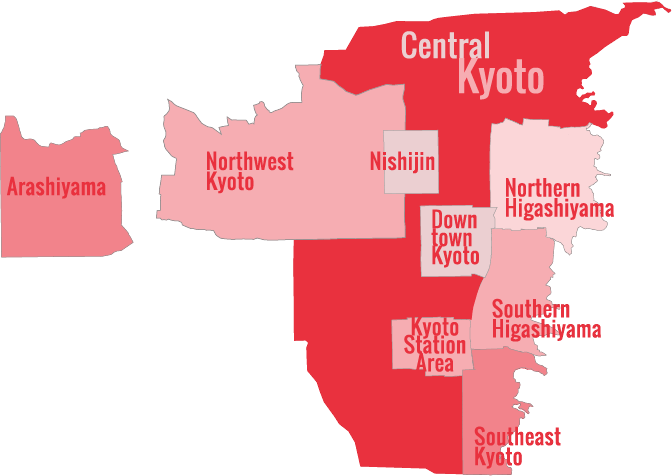 Kyoto remains the center of the Japanese tea ceremony world (and tea growing world, for that matter, since much of it is grown in the southern suburb of Uji). The three main schools are all located here and it’s a fantastic place to sample an actual tea ceremony. Sadly, like so much in Japanese life, form has come to dominate function, and the rules and precise etiquette of drinking tea is now take precedence over the enjoyment of the tea and the company. Conversation is rigid and predetermined, movements are rigid and fraught with tension, and only the most truly adept or the most truly obtuse can possibly not become infected with the mood of “kincho” (nervous tension) that pervades almost all tea ceremonies today. It is my guess that the tea banquets thrown by the Muromachi nobles did not suffer from this excessive formality, but then nobility has a way of rising above the laws of behavior that fluster mere mortals. All that said, there are some good places in Kyoto where you try a real tea ceremony and I’ve carefully chose three where the spirit of tea (that is, enjoyment) is emphasized more than the mere rules and forms. Camellia is an extremely welcome addition to the Kyoto tea scene. Located right off of Ninen-zaka, one of Kyoto’s most important tourist lanes (not far from Kiyomizu-dera Temple), Camellia is a refuge of quiet from the passing masses outside. Run by a charming and fully bilingual lady, Atsuko Mori, the tea ceremony here strikes just the right balance here between excessive formality and casual informality. Participants are encouraged to relax (and they do) and Atsuko’s history and explanation of the tea ceremony is just right: not too academic but not too shallow to bore the true Japanophile. Meanwhile, her movements and grace are exceptional. Right down on Higashioji-dori Street, the heart of the Southern Higashiyama sightseeing district, this quaint tea house is the perfect casual place to sample the tea ceremony. The charming young lady who runs En provides a great explanation of tea and puts her guests right at their ease. It’s a great way to recharge halfway through a day of sightseeing in Higashiyama. Website: En (check the map on the site as it’s very hard to find without it). Very close to Kinkaku-ji Temple, this tea ceremony venue is located in a private house. 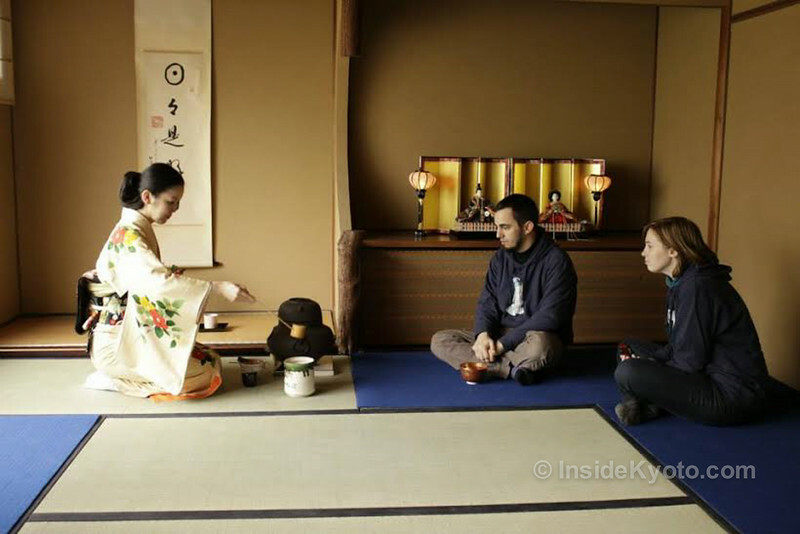 It’s a great place for a casual introduction to the tea ceremony and a nice way to take a break from touring the temples of Northwest Kyoto. For full details, see our Tea Ceremony KOTO page. Run by two foreign tea masters, Tyas Sosen and Stephen Soshun, Tea Ceremony Kyugetsu offers a great introduction to the tea ceremony. Presented in a stunning Gion townhouse, these tea masters give a thorough and insightful introduction to the history and meaning of this practice while serving the highest quality, organic matcha tea and traditional Japanese sweets. They are engaging hosts who cleverly draw their guests into the moment in order to experience what lies at the heart of this ancient cultural practice. In addition to proper formal tea ceremonies, many temples offer simple stripped-down tea ceremonies in which they will serve you a Japanese-style sweet with a bowl of matcha (powdered green tea). These will usually be served looking over a lovely garden. The usual price is Y500. Two of my favorite places for this include Nanzen-ji Temple and Shoren-in Temple.